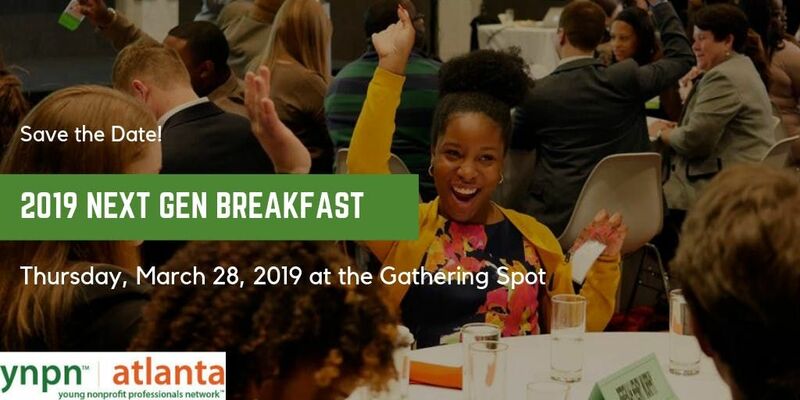 Join YNPN Atlanta for our sixth annual YNPN Atlanta NextGen Breakfast on Thursday, March 28, 2019 at The Gathering Spot for a morning of collaboration and idea sharing with peers and sector leaders. Registration opens for members only from 1/24-1/31. Find out more about each of our guests on our website. Register now before your favorite local nonprofit luminary's table fills up! YNPN Atlanta Members: To receive a $10 discount on your ticket, visit the Member discount page. Make sure to buy your ticket by March 14! Ticket sales will end at 11:59 PM on Thursday, March 14 (if we don't sell out first!). Organizations are not permitted to buy out table for one table host for their staff (no more than 3 employees from the same organization at the same table). Solicitations to table hosts and their organizations are not permitted at the event. Members are not allowed to share their promo code with non-members. **Because of the limited capacity at the NextGen Breakfast, no refunds will be issued. The Gathering Spot is MARTA access via the 26 or 50 bus line. If you are driving, there is free, lot parking. YNPN Atlanta reserves the right to use any photograph/video taken at this event, without the expressed written permission of those included within the photograph/video. YNPN Atlanta may use the photograph/video in publications or other media material produced, used or contracted by YNPN Atlanta including but not limited to: brochures, invitations, newspapers, social media posts, television, websites, etc.